SPECIAL PRE-PUBLICATION SIGNING! 5 days ahead of official publication date! 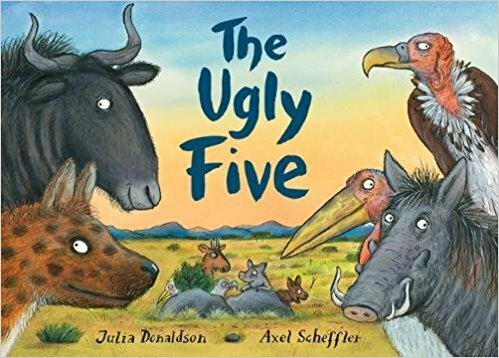 We are thrilled that Julia has agreed to come for another signing, this time to celebrate the release of her brilliant new picture book, ‘The Ugly Five’, illustrated by Axel Scheffler. A great chance to meet Julia, and buy a personally signed and dedicated copy of this funny, heart-warming story about Africa’s ugliest animals, inspired by Julia’s experiences on safari in the African Savannah! A new Julia/Axel picture book is always a treat and this joyous story is another instant classic from the dynamic duo! The signing will take place in the beautiful back garden of the bookshop, with lots of space to relax as you wait for Julia to sign your book, and shelter in case of rain. As always, there will be plenty of entertainment on offer for those waiting, including sing-alongs with Julia’s husband Malcolm on his guitar, and African animal-themed activities and refreshments for your little ones. It’s sure to be a day to remember! Julia will be signing from 2.30 pm on Saturday afternoon. This is a free event, no need to book, although for queue management we will issue tickets for timed signing slots at the time of book purchase. ‘Ugly Five’ books will be available for purchase on the day from 9.30 am, it is also possible to pre-order and pay for your book in advance.